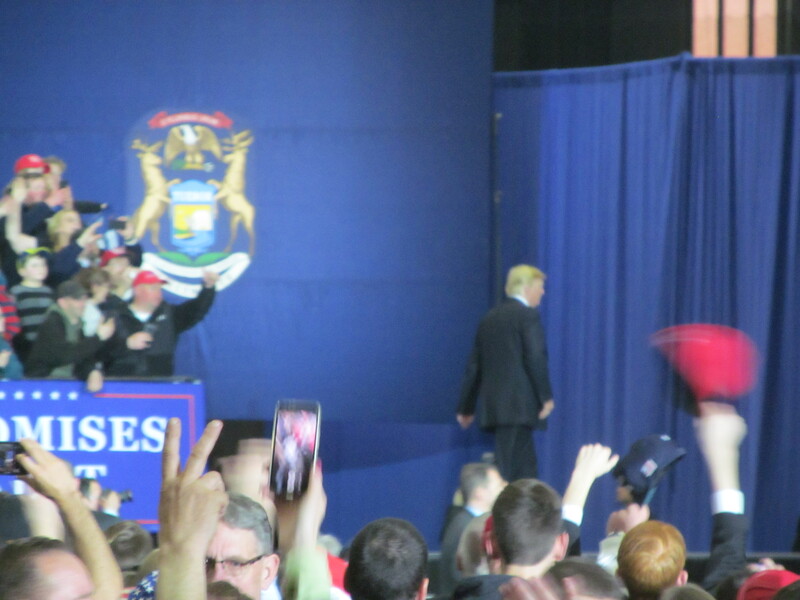 Trump Rally – Washington Township, April 28, 2018 (Follow up). I had mentioned earlier about this little shindig happening over in Washington this weekend (Michigan, NOT DC). I also alluded to the fact that I’m not some mindless political cheerleader or brain-dead party apparatchik. If I see that something isn’t right, I have no qualms in saying it. Conservatives have already lost far too much ground by being “polite”. On the flip-side, I do have several friends who still think rather highly of Pres. Trump. One of them convinced me to mention it here on Right Michigan (and on a side note, persuaded me to attend with him, along with a few others). Unfortunately, he got delayed in getting out of Indiana. To make matters worse, he ran out of hours and there was no way (legally) for him to make the return part of his run back to Michigan in time to attend. Even though I may not be part of the aforementioned apparatchik, I do try to look after my friends whenever I can. 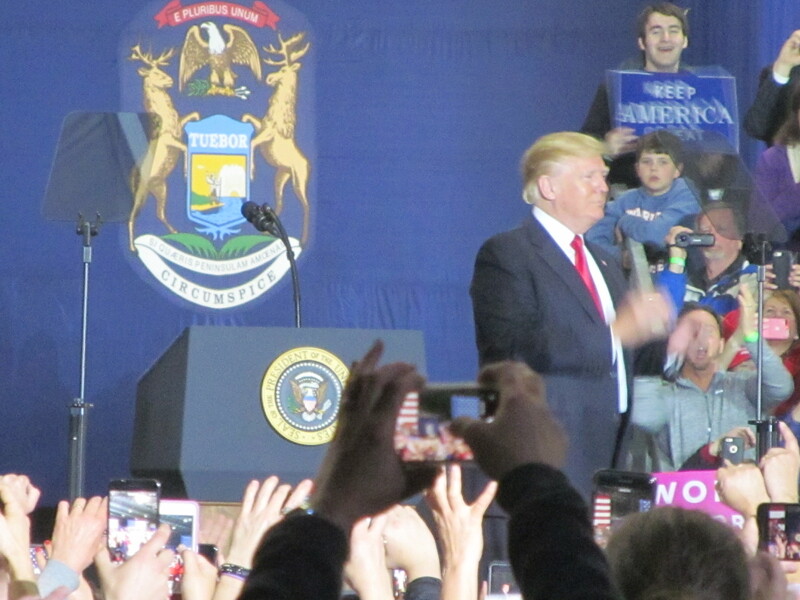 So as a courtesy to him (I told him I‘d have this up this evening), along with other Right Michigan readers who were unable to attend, I have included material from last Saturday. along with these sad and pathetic losers. It’s amazing how quickly these buffoons shut up when confronted. 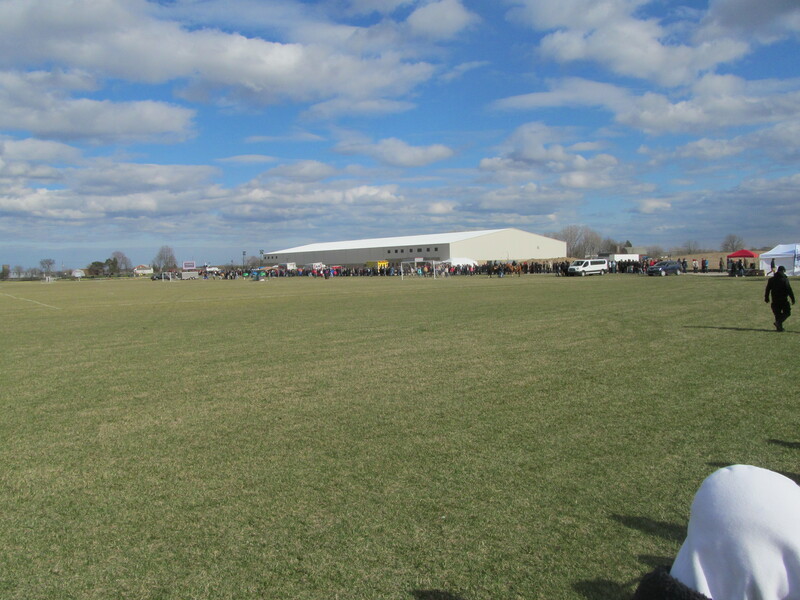 This is what the line looked like about an hour before the gates opened. 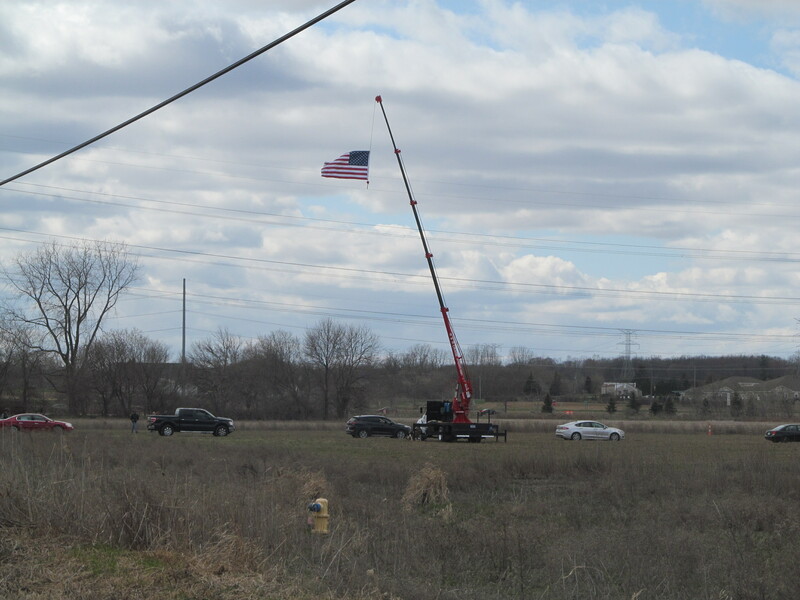 Just to give people an idea of scale, we were about a mile from the entrance on 30 Mile Road where the line ended. 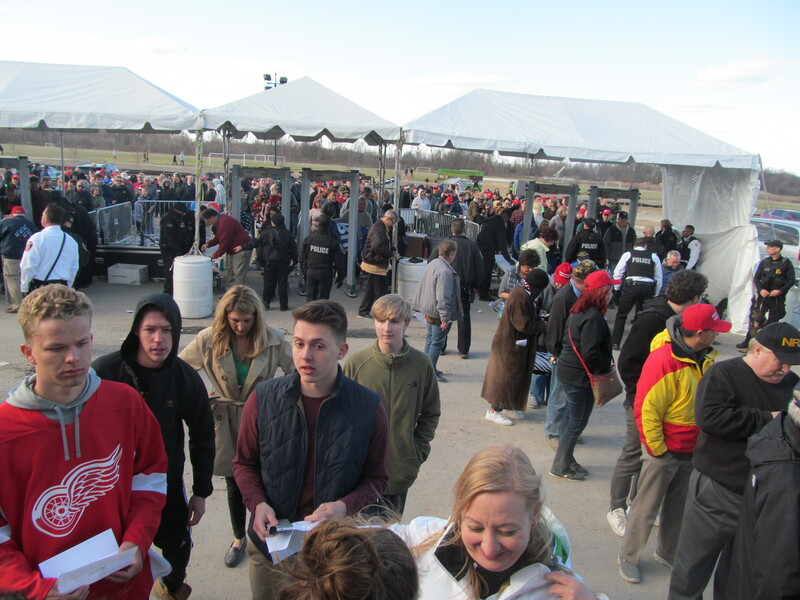 When the gates opened up and we began to move, we entered the next section of people waiting to get screened before entering. Oh, no! What were these two thinking? 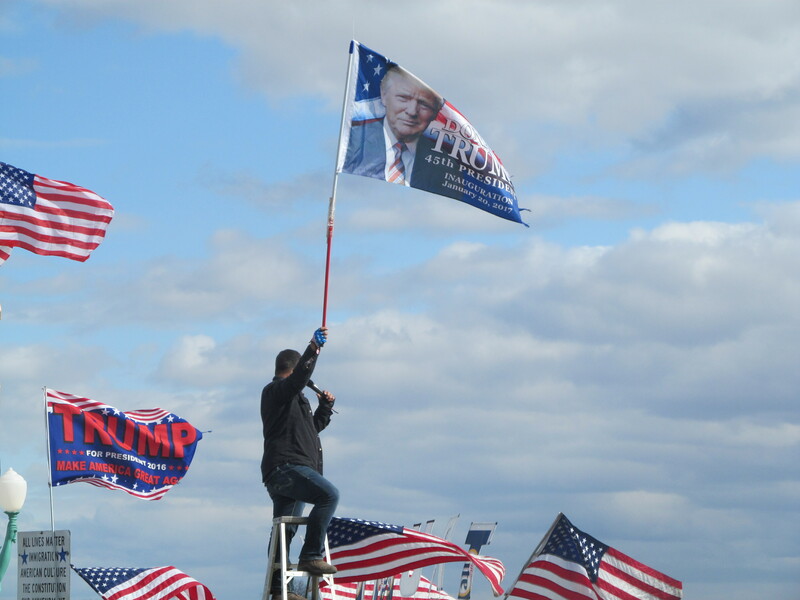 At the end of the second line, we passed the Trump Bridge along with this guy. Definitely no lack of enthusiasm here (or Colbeck material!!!). 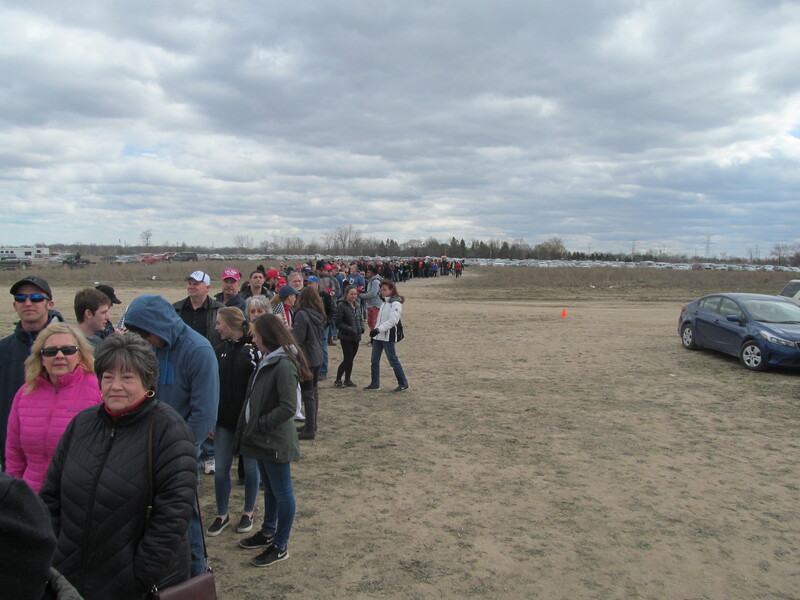 Then came the third section of line and about another half mile-ish walk. Finally, we were in the home stretch. The front door was finally in sight! Um, buddy? I think that your secret is out. After dealing with TSA-ish “security”, we finally made it up to the front door. 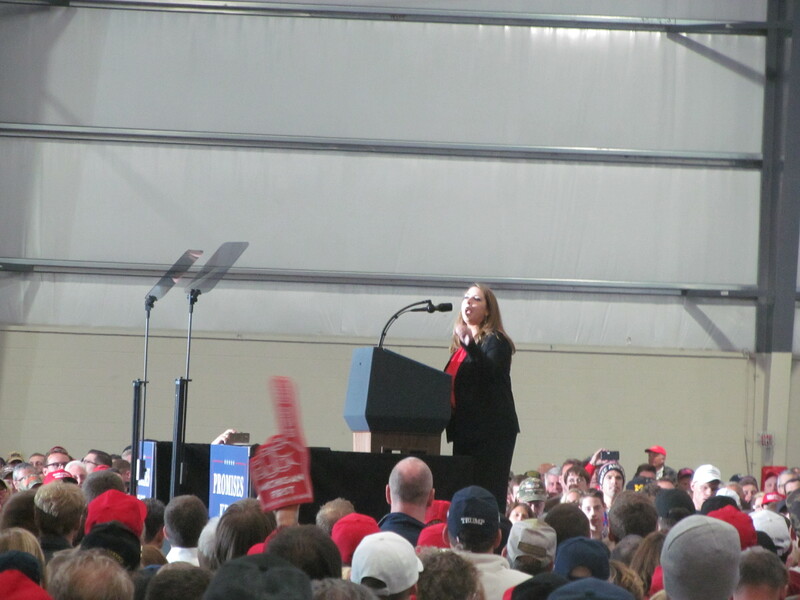 After entering the arena, and adjusting our eyes to the change in light, the rally had already started and various republicans on the state and federal level were making speeches on what a great guy Pres. Trump was. Which was ironic given the amount of back-stabbing these jackals had done during the ’16 campaign and ever since he was sworn into office. And just in case anyone was wondering, Gov. 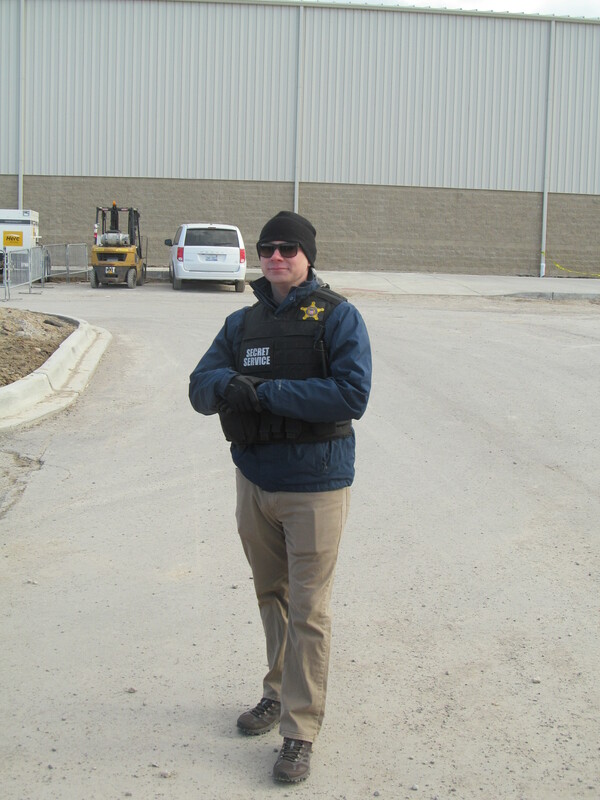 Snyder nor LG Calley were anywhere to be seen around the event. I should also note at this time that most of my camera gear was on the “prohibited item” – list so the quality of the images (and video) from here on in was pretty much on a wing and a prayer. 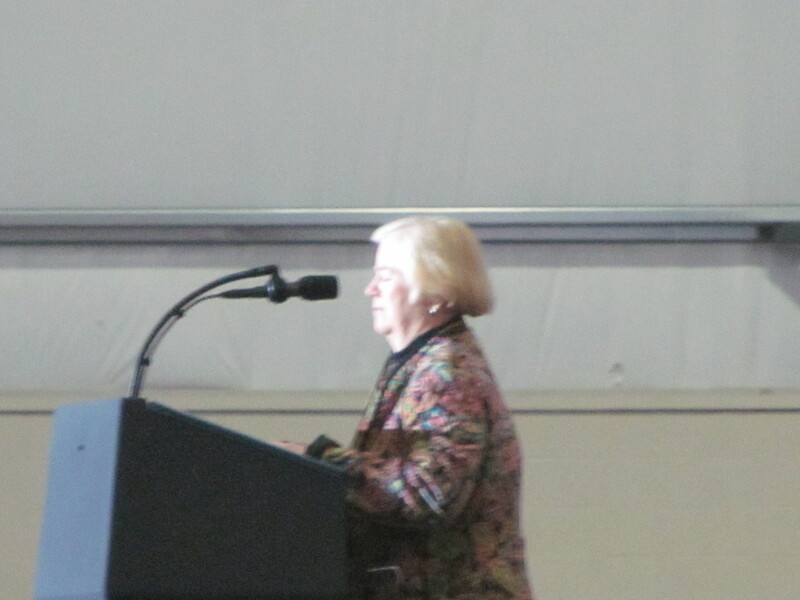 Macomb County Public Work Commissioner Candice Miller. Yes, people were booing this guy. I cannot imagine why? May I have your attention please? May I have your attention please? Will the real Slim Shady, please stand up? Oh, there you are! Seriously, after watching this bi-polar bunch of speakers from Michigan, the dog was far more believable and enjoyable to watch. Hello, my name is Deplorable. 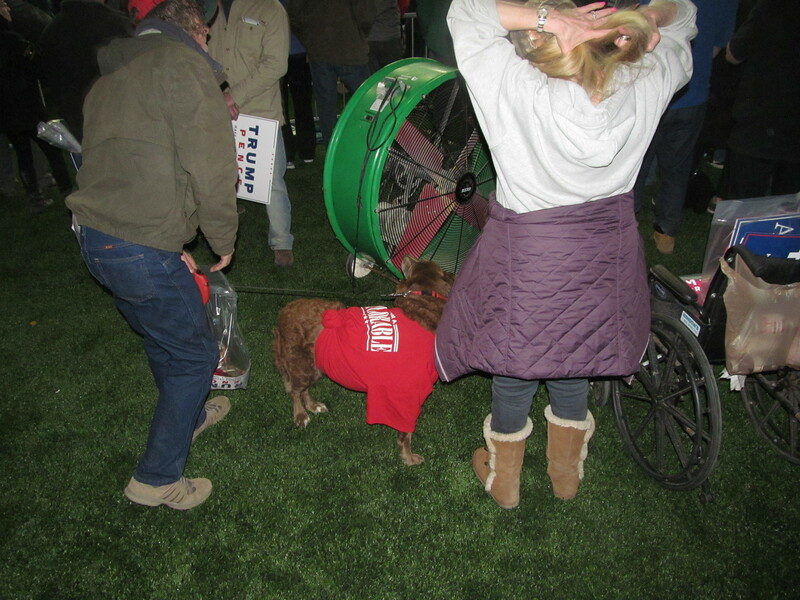 This dog was much more friendly (and believable) that most of the politicians “warming up” the crowd. After, I’m presuming the SS, placed the seal on the lectern, the wait was almost over. A little after 7:20, Pres. 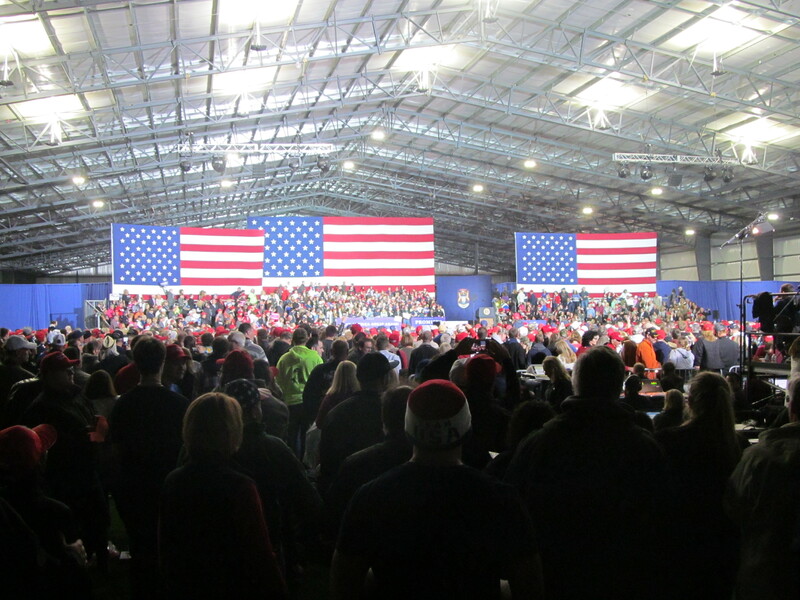 Trump began to speak (and started tearing into the Fake News media who were hogging up prime viewing space at the center of the arena). Fake News Media situated at prime viewing area on riser at right of image. At about quarter to Nine, Pres. Trump ended his speech. All in all, it wasn’t a bad event. Throughout the entire day, I had enjoyed speaking with a number of Conservatives from not only Michigan, but from other states as well. I’ve heard Pres. 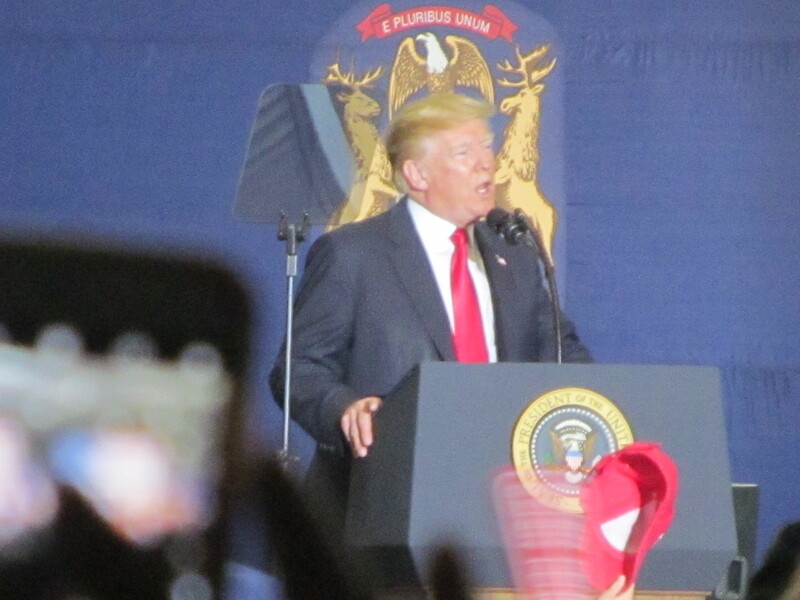 Trump speak before on C-Span and on YouTube, so hearing and seeing him up close was an interesting experience. I will say that I liked the fact that he talked to the audience. He didn’t talk down to the audience, and he certainly didn’t come off like a two-bit con man (cough, cough…speak like a democrat), looking to win you over. Some of the highlights that I’d like to see him follow up on that he covered in his speech are the “Refugee” Caravan that Mexico is literally dumping on our front door, the price tag on the Jerusalem Embassy (and the “new” price tag)…why this man didn’t handle the London Embassy deal is beyond me (thank you Pres. Bush for your ineptitude), will that “new steel” into the Spine of America be American Steel and EXACTLY what he will do during the next federal budget “showdown”/Government Shutdown in Washington this coming September…that I’ll believe when I see it! I scared several republicans (at least I think that were republicans). 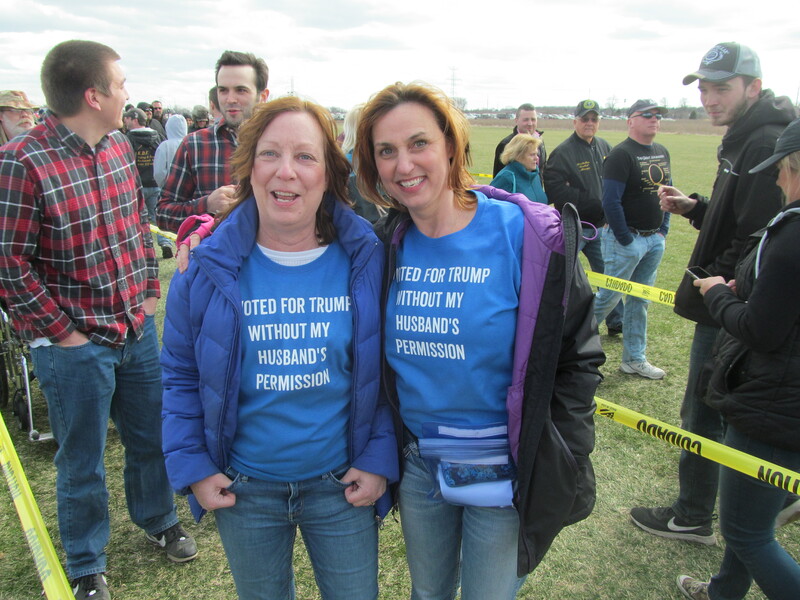 They were walking around the crowd and shaking hands, but were not dressed like everyone else. Unlike Pres. 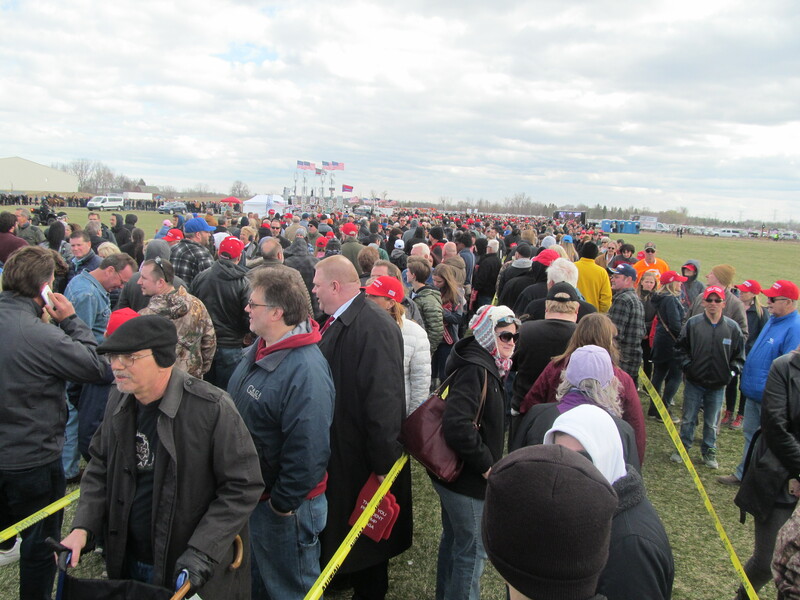 Trump, this crowd doesn’t like it when the people that are talking to, are much more informed than they think regarding who they are or what they have done/not done. One last bit, since my friend was unable to attend. 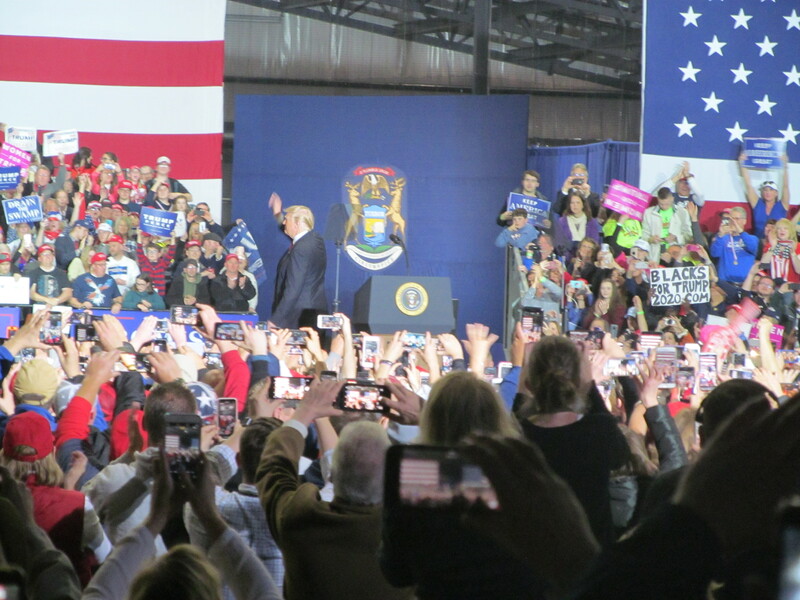 I am including the raw video from the rally at the end of this post. I would like to reiterate that given the fact that most of my equipment was “prohibited” from the arena (something that didn’t apply to the MSM), this IS NOT my best work. 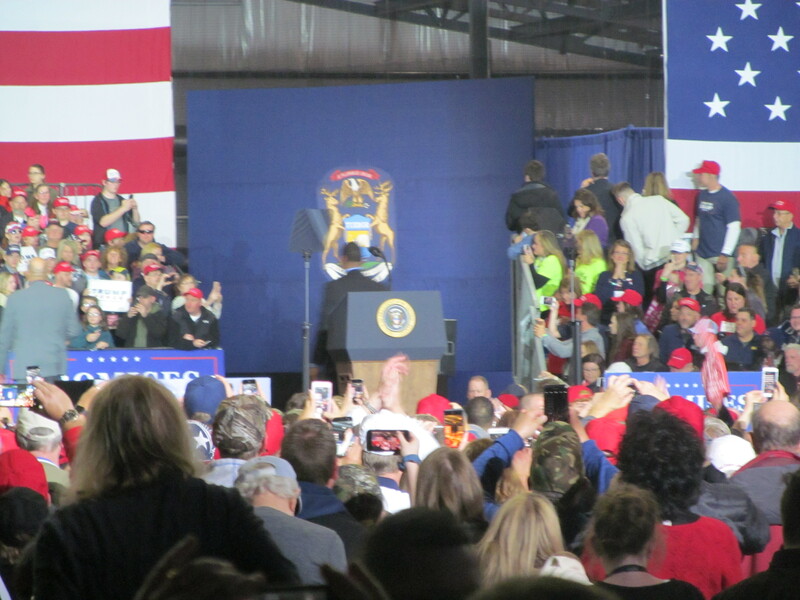 The audio is fine throughout the entire speech, however the crowd walking in front of me throughout the night threw off the focus on several sections of the speech. Enjoy, buddy (and Right Michigan Readers)! 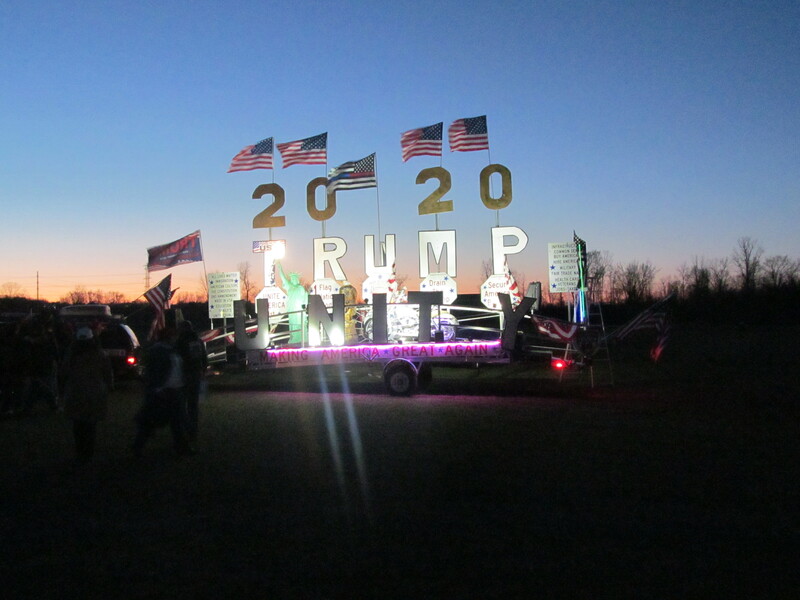 KG Thanks for sharing--I heard about 30K showed and there were about 100 Dimms protesting. I see you neglected to get photos of this group. C-Span aired it live and enjoyed his inviting Corey Lewandowski up on stage. 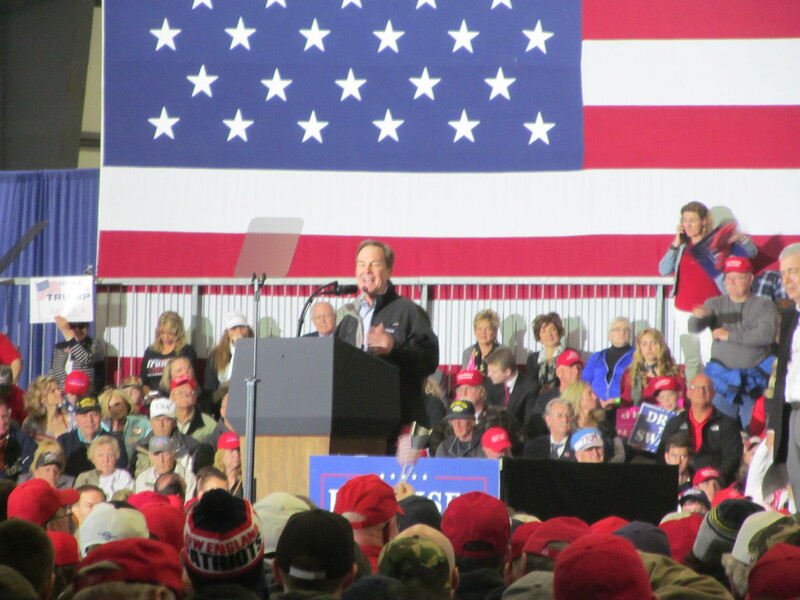 And, my buddy, General Jack rode in the car with Trump lobbying about the Soo-Locks or something--but know how Trump loves generals, am really quite worried that Trump wants to tap him for VA Secretary. Jack, as President of the Freshman class, has given him lots of contact with our President. (Thus, we here in the 1st CD sent TWO presidents to DC. Hey, it's how we roll up here). The 30K number sounds about right. 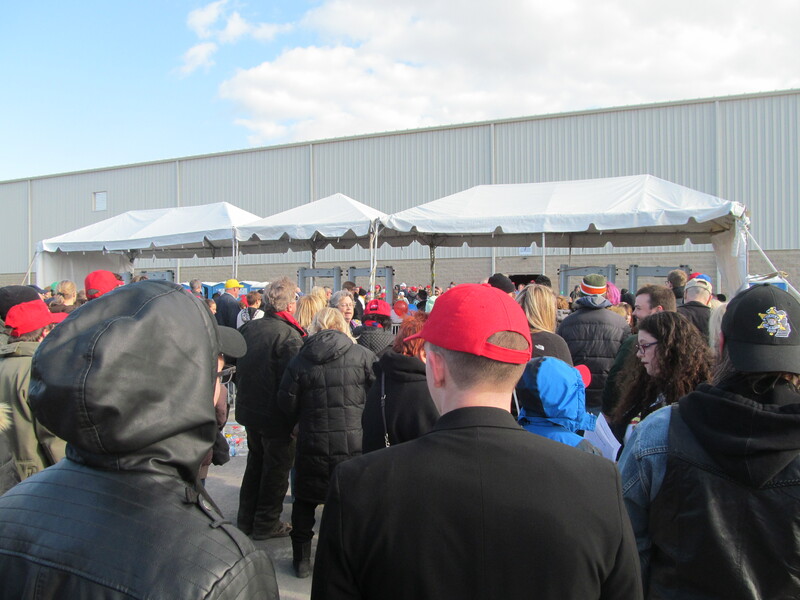 I wasn't doing an exact head count, but I was told by others that night, that a number of attendees who were unable to enter the building due to the Fire Marshal's orders and watched the event outside. 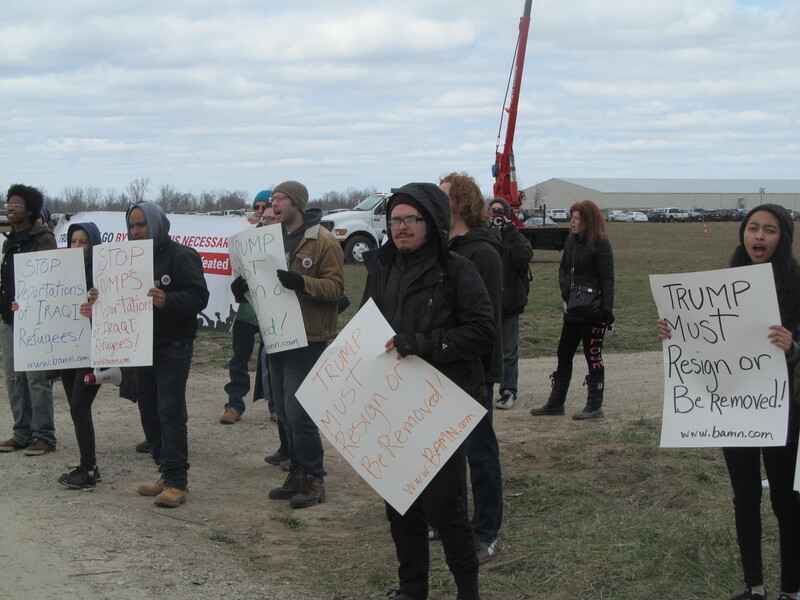 And I didn't neglect to show democrats protesting, because to put it bluntly, they were not even there. They could barely even scrounge up 100 at their counter rally over in Shelby (and THAT was at a UAW Hall of all places and on a Saturday no less). Whenever reporters use a medium shot of speakers and attendees at an event in their stories, they do it in order to not embarrass them because of the low turnout. All told, there were barely over a dozen protestors at the front gate, and two loons walking around the crowd with anti-Trump signs. The democrat's presence in Washington was negligible (at best).